Plot : The story revolves around Kammaran Nambiar who is known as an independence leader among his natives.The movie will unfold his past which was the period before independence and a period after the independence. Dileep with an excellent performance, which can be rated as one of his career best performancess.He was excellent in bringing out expressions like anger,frustration,cunning etc .His dialogue delivery was also impressive as well as his looks.Tamil Actor Sidharth debuts in Malayalam with a superb performance.He was also terrific with his screen presence and acting.Namitha Pramod did a reasonable job as the lead actress.Another noticeable performances came from Murali Gopy,bineesh bastein,manikuttan etc and the rest of the cast did a reasonable job. As we all know , it is always tough to execute scripts penned by Murali Gopy and here also , its a tough ask for the debutant director Ratheesh Ambatt. But he was succeeded in executing this confusing script into a fine cinematic experience.A first half which tells the past of Kammaran was pretty much thrilling and kept audience interested in the seat and interval punch was impactful.Songs were shot well and movie was very much paced.There were lot of moments to laugh as well.Coming to the second half , its more of a satire/spoof approach, here the director has done a great job to make the audience understand the theme implemented by Murali Gopy in the script. The second half briefly explain the term politician and the term politics in a great manner.On a whole , the director deserves a standing ovation. Coming to Murali Gopy, it will be better if he starts writing scripts in a manner in which it can easily be connected to audience. 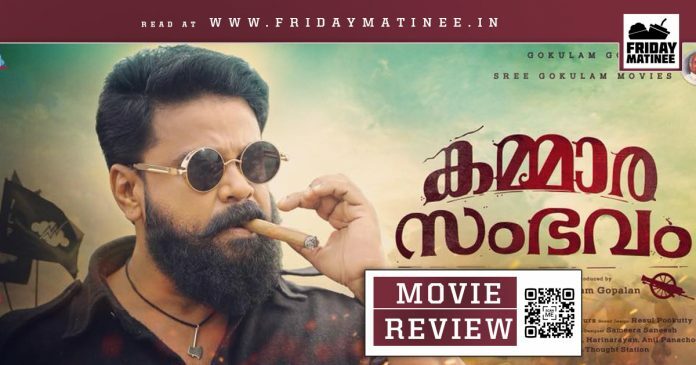 The cinematographer Sunil deserved a loud applause as the frames were damn excellent and it provides this movie an extra mileage.The way in which he has captured the frames is simply magical.Songs were brilliantly shot as well as the dark mood scenes.The second intro of dileep will be one of his career best.Coming to editing side, editor suresh also did a good job by doing a crisp work for a movie with a duration of 182 minutes. 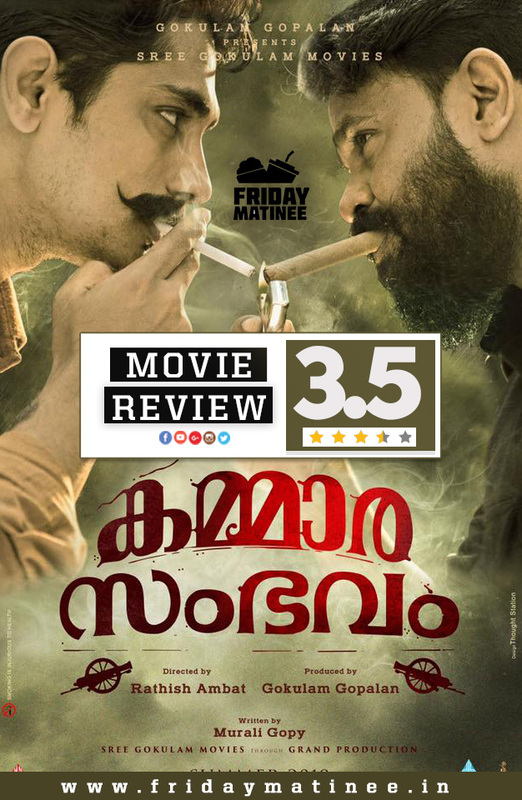 Verdict : On the whole , KammaraSambhavam is a fine cinematic experience thanks to lead actors and technical expertise. The first half tells story about the past and is more of thrilling mood while second half has been purely sarcastic/spoofy. On the whole , KammaraSambhavam is a fine cinematic experience thanks to lead actors and technical expertise. The first half tells story about the past and is more of thrilling mood while second half has been purely sarcastic/spoofy. SuperStar’ s Cameo in Kochunni :Mohanlal or Surya? Check Out the Latest Snaps Of Mammootty!! !